There is one trait that we need to have for working in a hospitality industry. What else if it’s not being, hospitable. 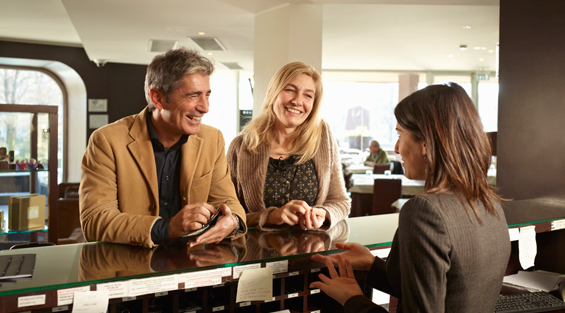 Here are some tips that we might need in having a hospitable interaction with our guests. Facial expressions are a form of non-verbal communication as a result of various movements made of our facial muscles. These movements convey the emotional state of the individual to observers. How can we control our facial expression? 1) Focused with our face looking ahead. 1) A proper body posture, straight up and facing our guests. 2) Focused without doing personal activities, such as playing with our mobile phone, reading newspapers or watching television. 3) Not chewing bubble gums or having our personal snacks. 4) Avoid chit-chatting in front of our guests, especially standing in groups. 3) Use the guest’s name fairly, normally twice in a conversation. 4) Be responsive with positive gestures. 5) Look neat and well-groomed. 6) Be efficient and helpful. 1) Recognize the guests’ needs. 2) Anticipate the guests’ needs.